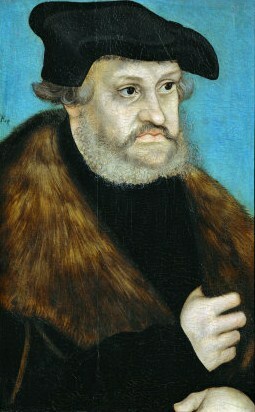 Frederick III, Elector of Saxony (1463–1525), Frederick the Wise, was the protector of Martin Luther, whom he offered asylum in his castle Wartburg. 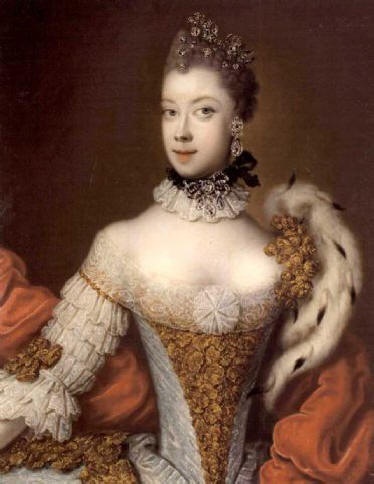 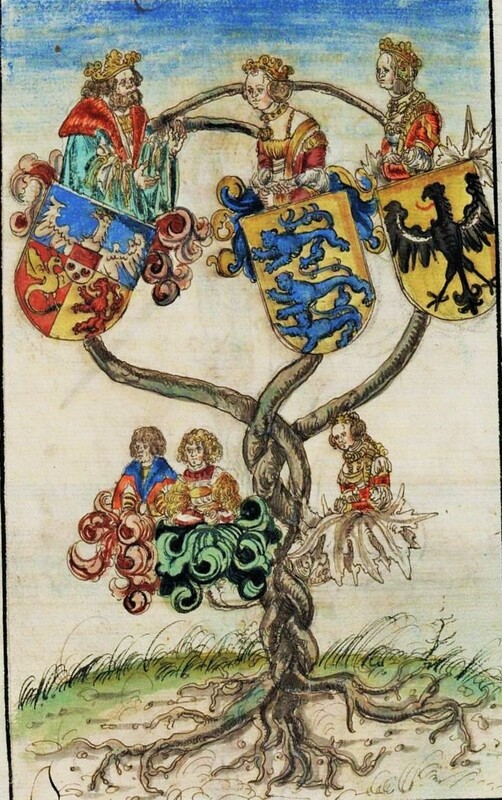 Frederick III also asked his chief secretary George Burkhardt (known as George Spalatin), to compile a history of the German regions of Saxony & Thuringia. 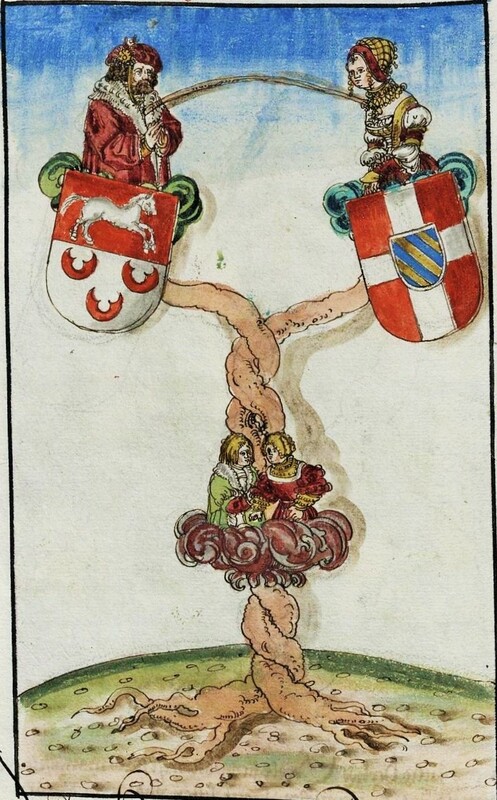 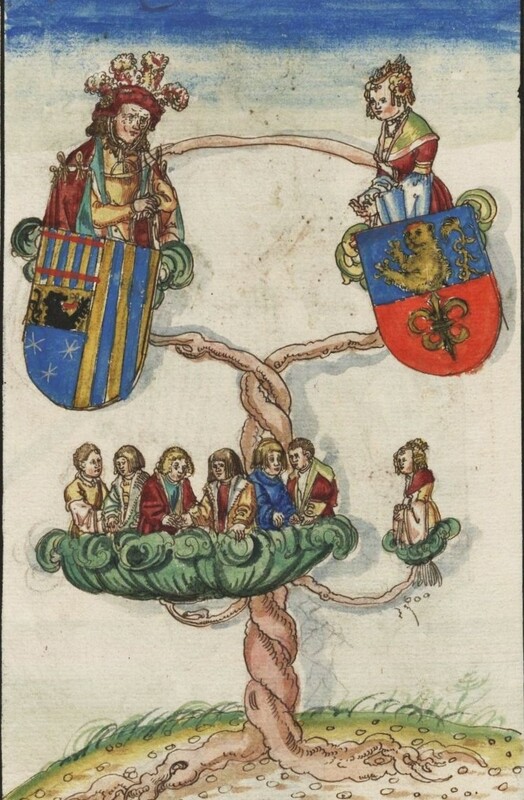 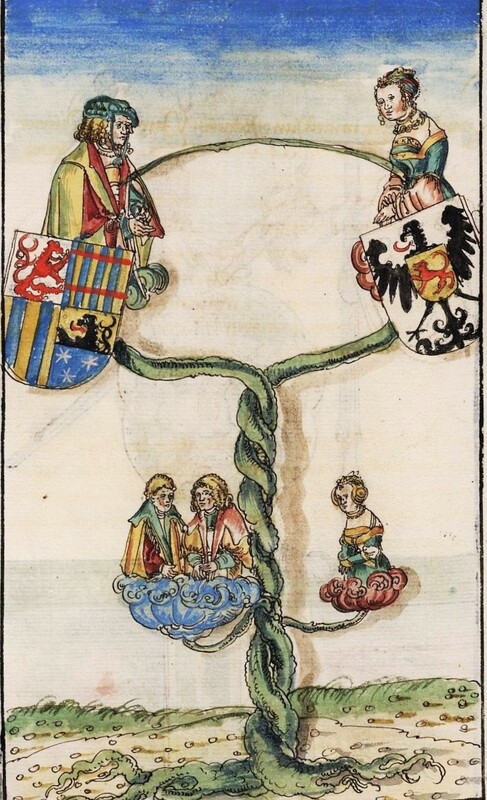 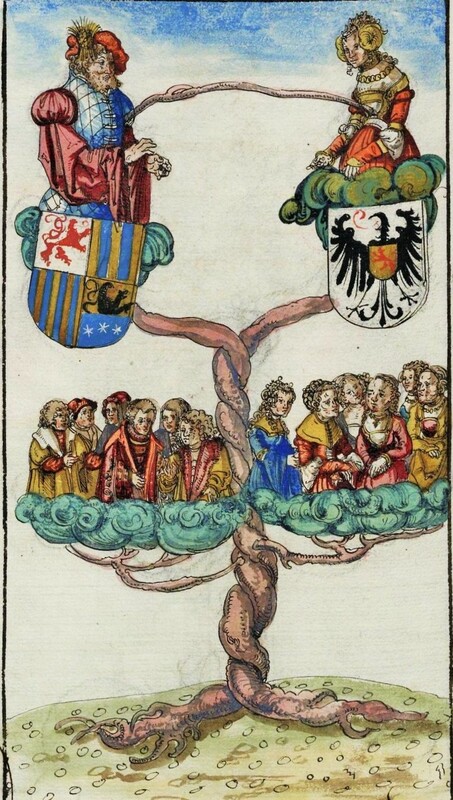 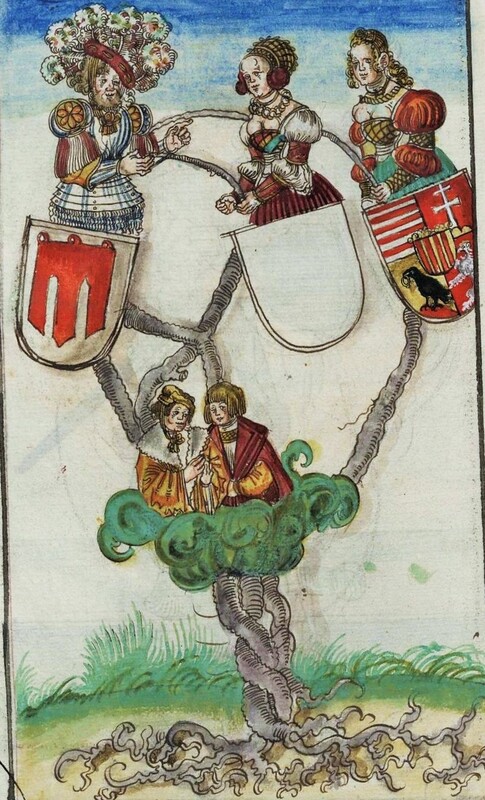 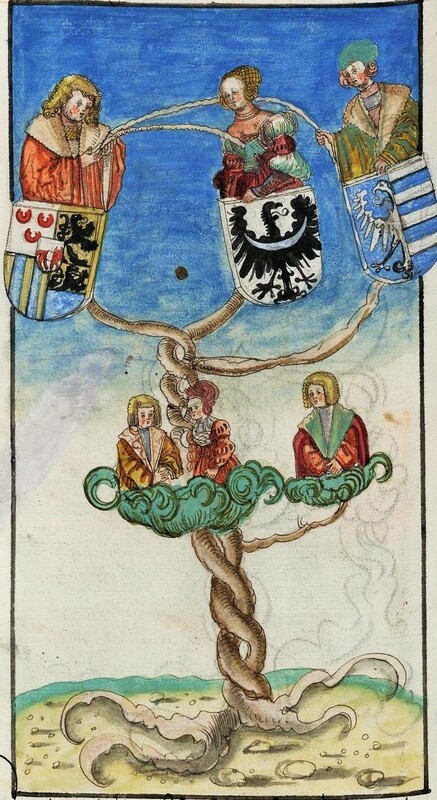 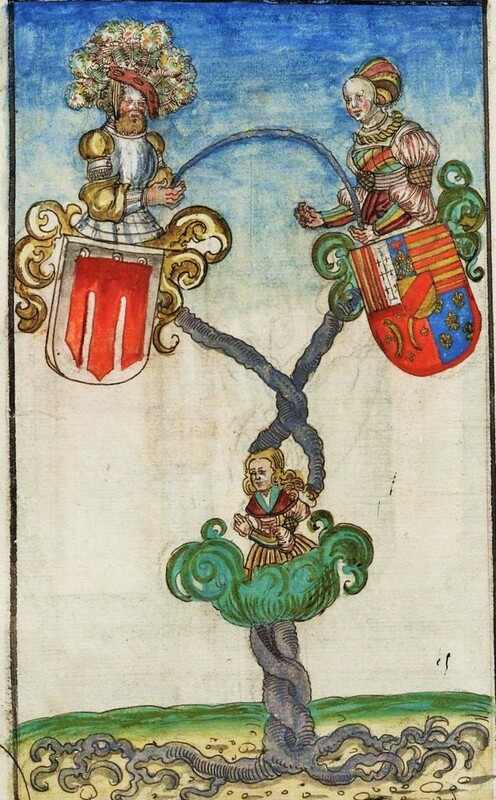 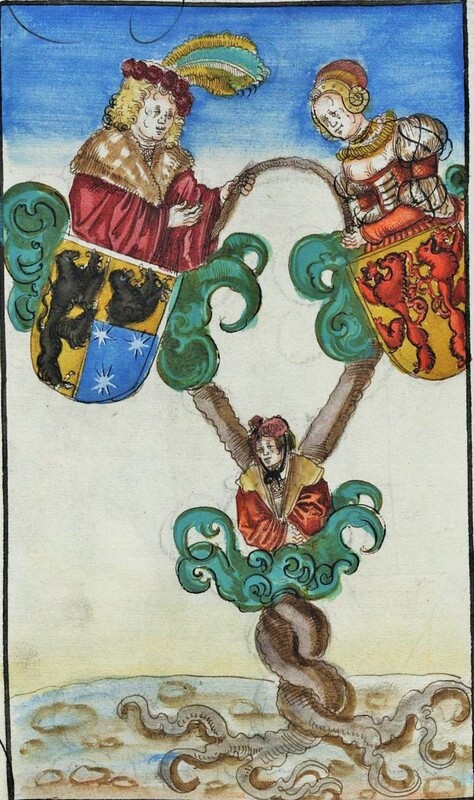 Spalatin created a family history for the rulers of the various regions depicted as family tree miniatures decorated with family crests (The Spalatin Chronicle Family Trees), painted by the workshop of Lucas Cranach the Elder (German artist, 1472–1553). 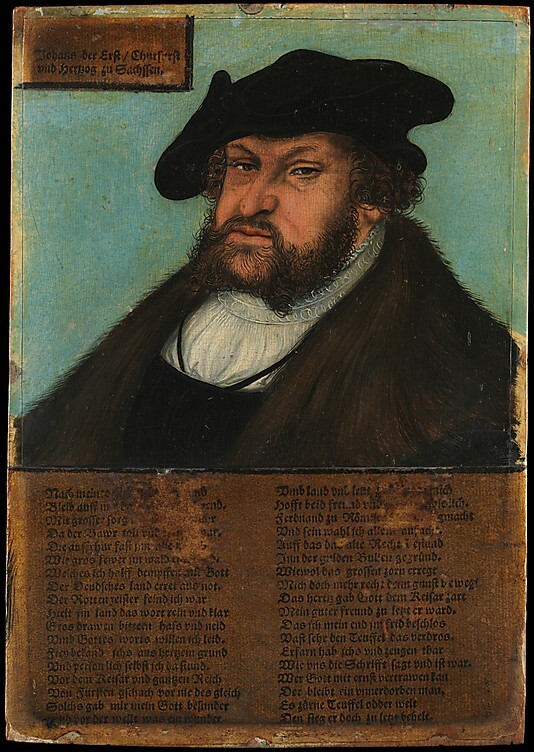 Cranach & his workshop also painted many full-sized portraits of Frederick the Wise in the years after his death. 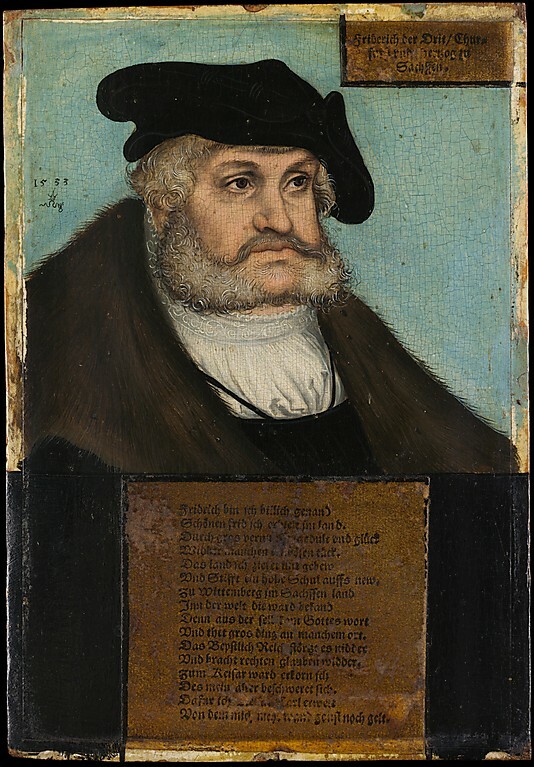 The label of this painting at the Metropolitan Museum of Art reads, "This panel and the portrait of John the Steadfast, the sitter's brother, are one of at least sixty pairs of portraits of his father and uncle ordered by John Frederick the Magnanimous from Cranach when he became Elector in 1532. 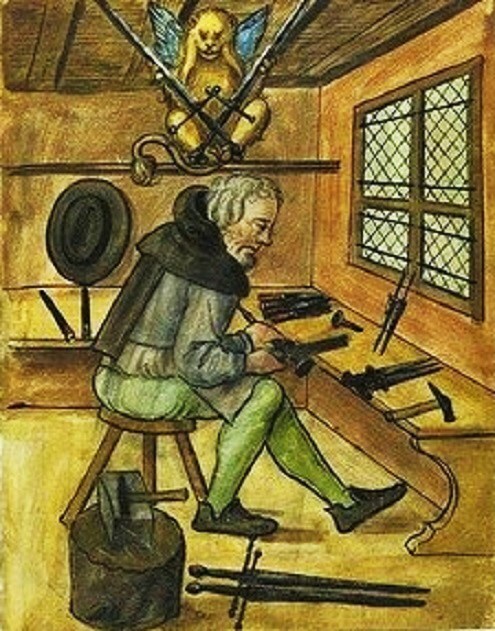 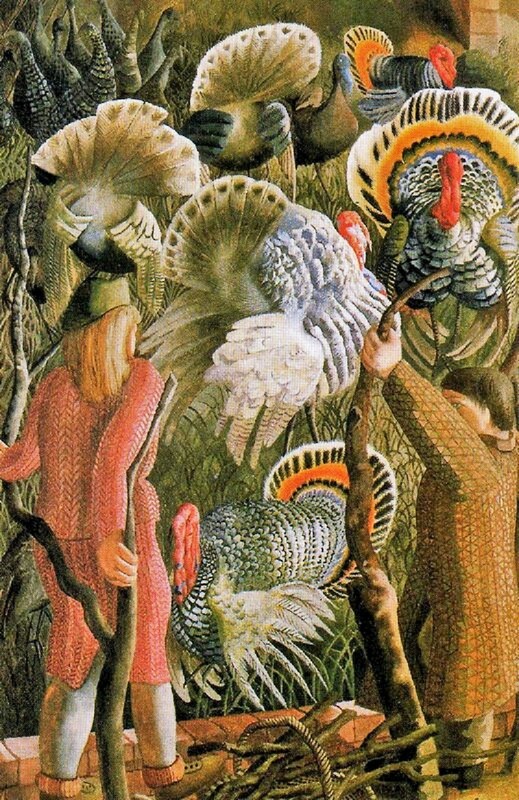 All three rulers were Cranach's patrons at Wittenberg. 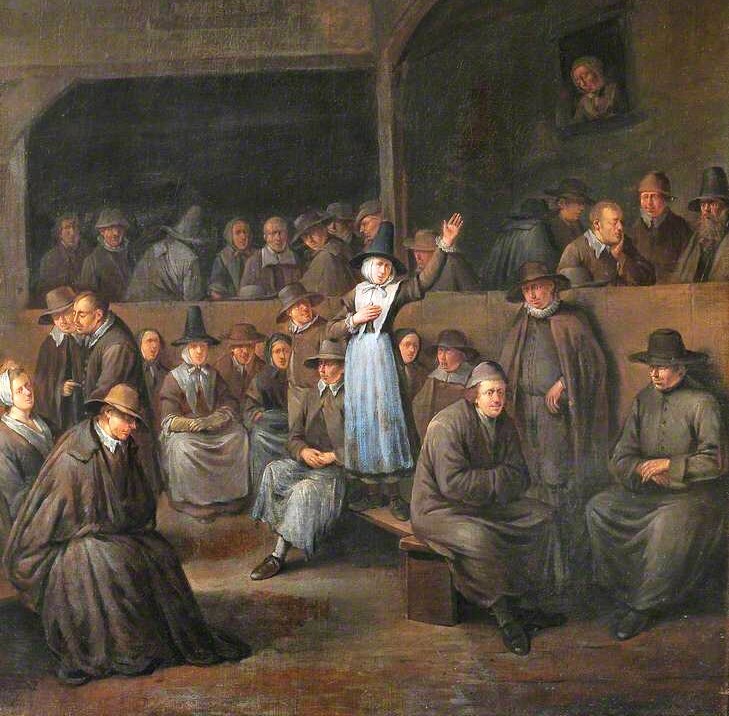 So extensive a commission would undoubtedly have been executed mainly by workshop assistants." 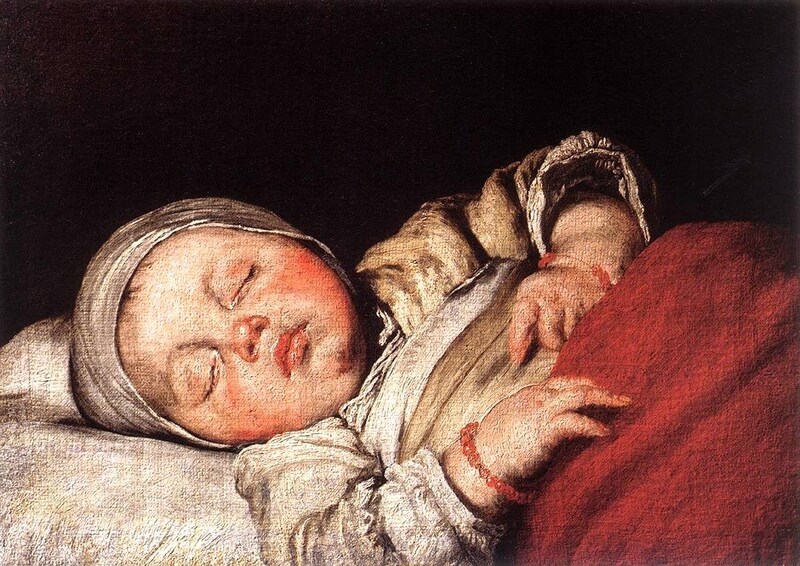 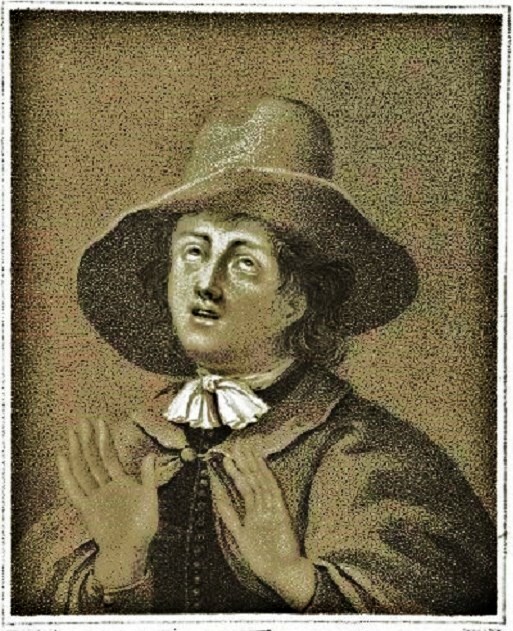 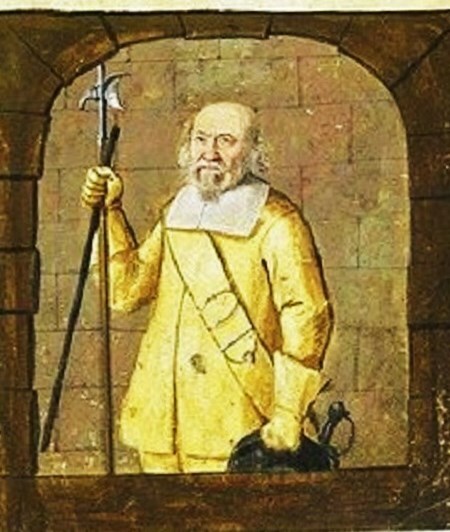 The portrait of Frederick's brother follows. 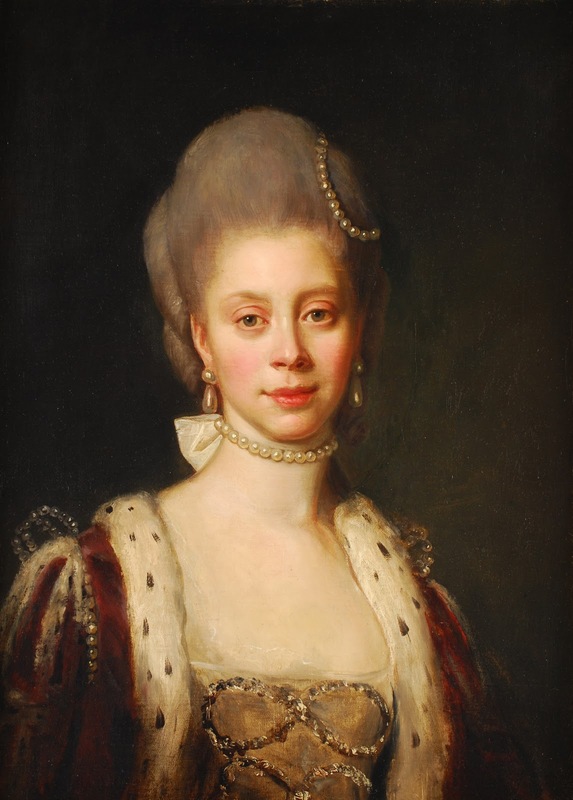 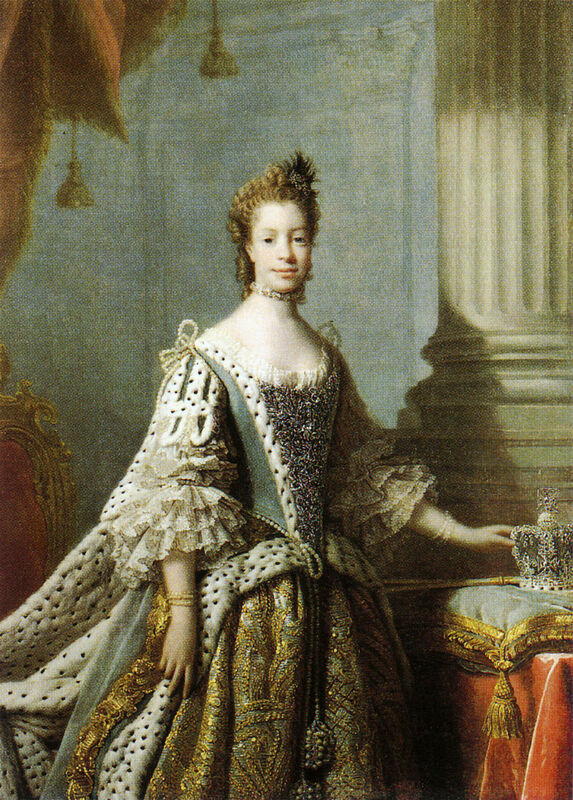 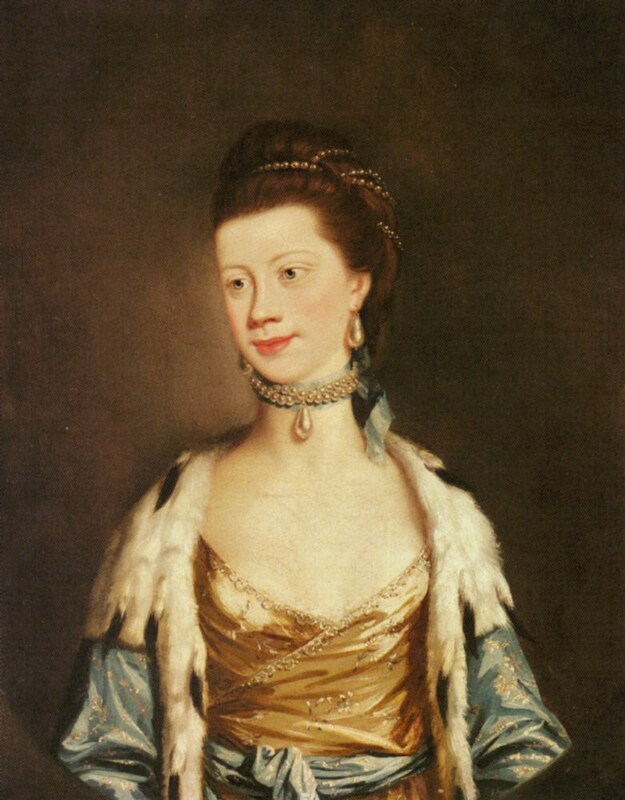 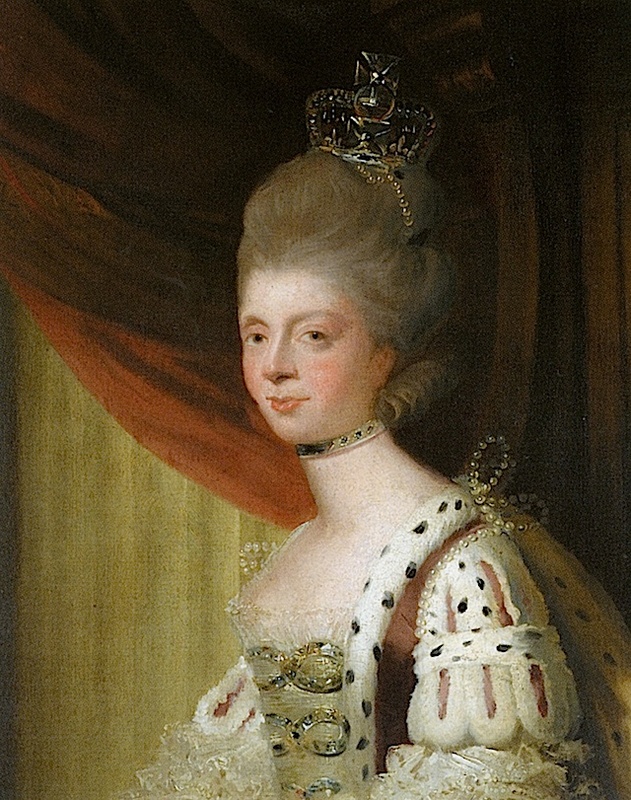 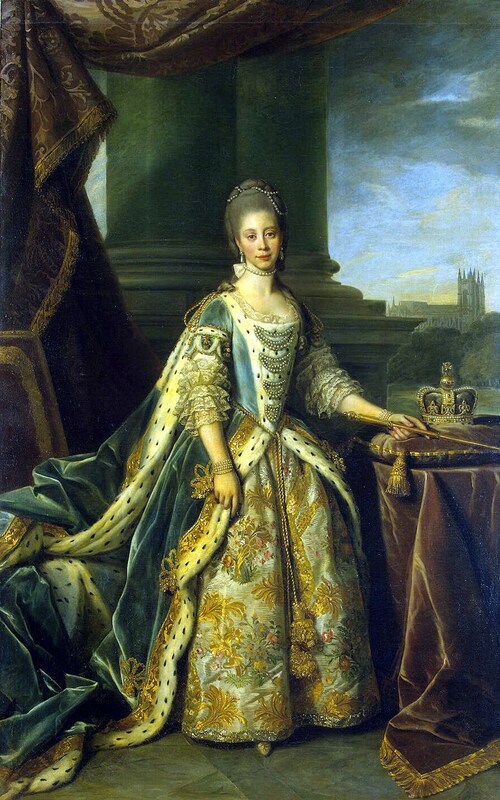 Although women were not slaves in the British American colonies, they were the property of their husbands. 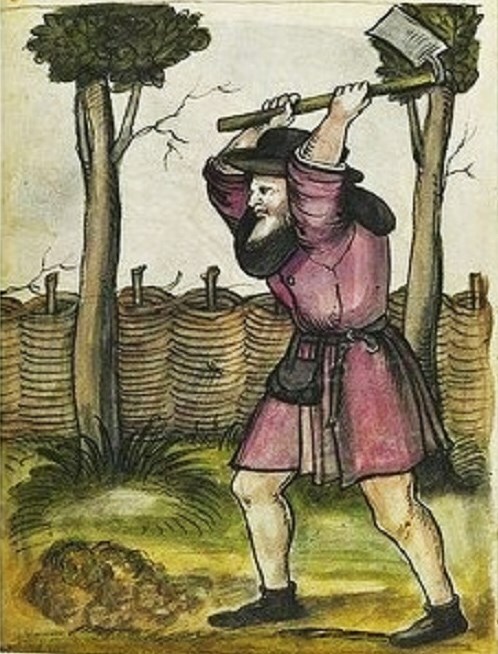 Fox went home, but was so troubled by the incident he couldn’t sleep. 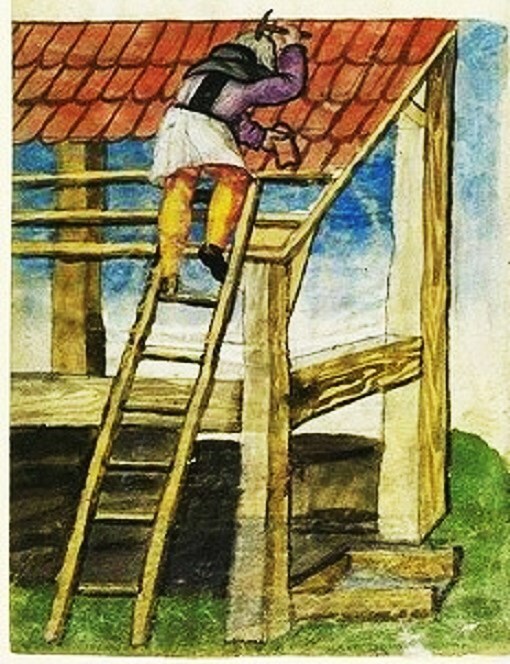 Instead, he walked up and down, praying and crying to the Lord. 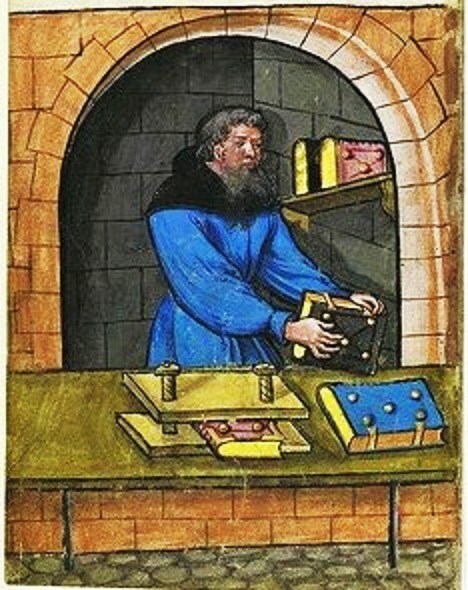 Soon he left home and wandered alone, seeking answers. 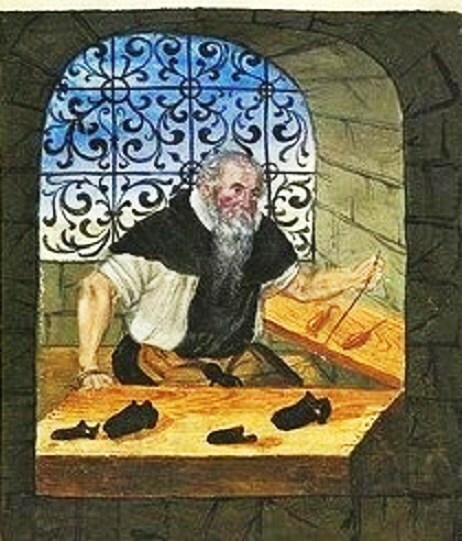 He became convinced that only those actually born of God are Christians, and they must worship God not with outward show, but with the spirit. 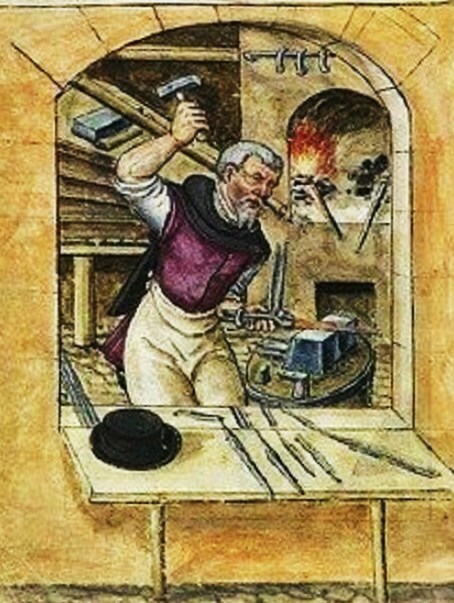 Certain that no one had answers for his unhappiness, he reached a crisis: “When all my hopes in them and in all men were gone, so that I had nothing outwardly to help me, nor could I tell what to do, then, oh, then, I heard a voice which said, ‘There is one, even Christ Jesus, that can speak to thy condition’; and when I heard it, my heart did leap for joy.” Ever after, Fox relied on inner illumination from the Lord. 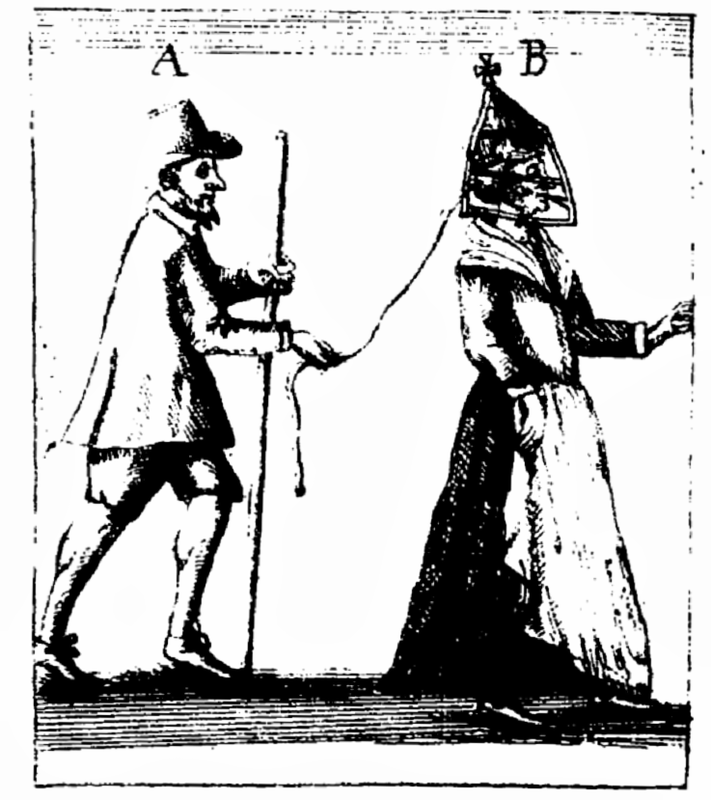 He formed a group called the Society of Friends. 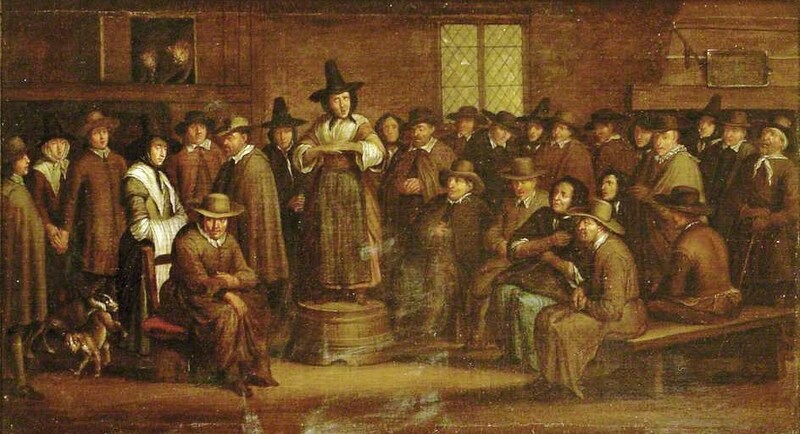 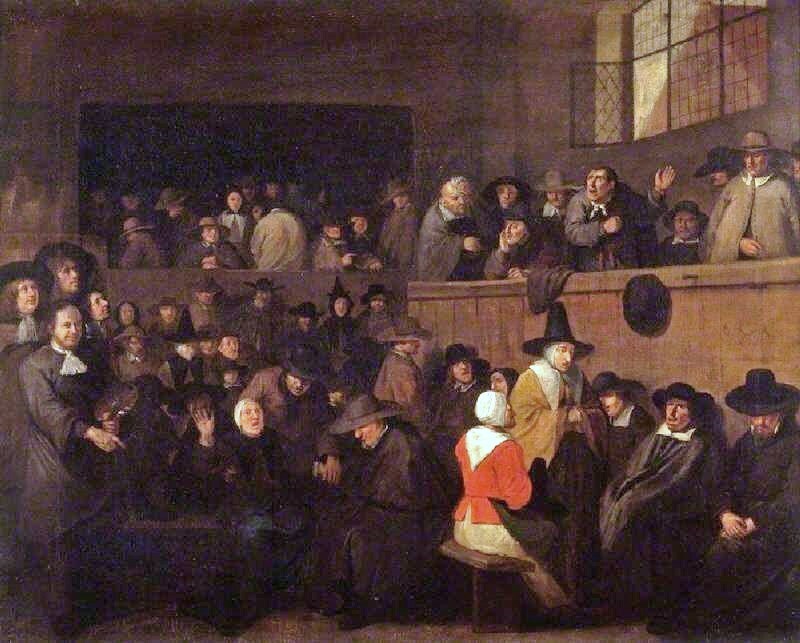 These believers worked against many intolerant and wicked practices in society, often getting into trouble for refusing to take off their hats to important people, preaching publicly without licenses, and refusing to take oaths to anyone but Christ. 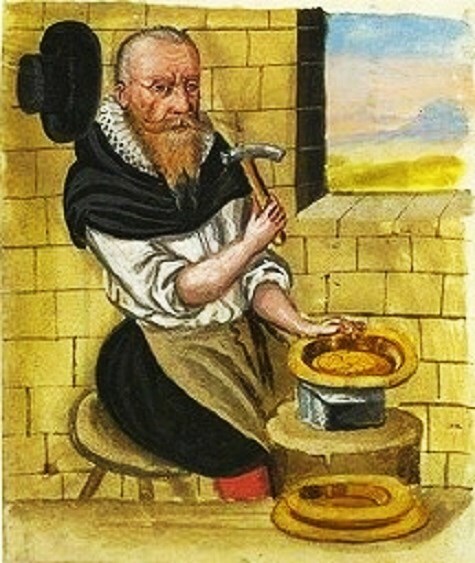 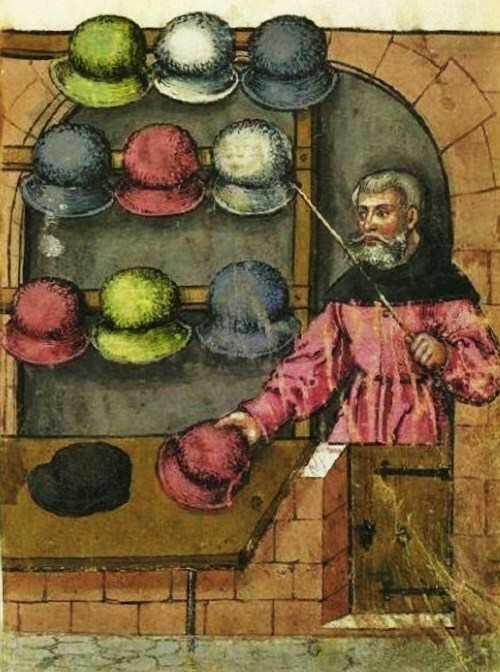 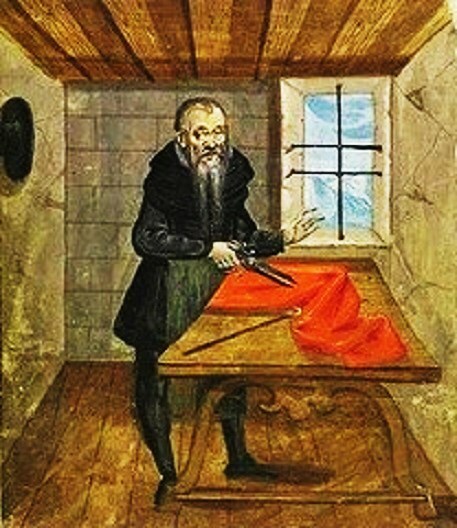 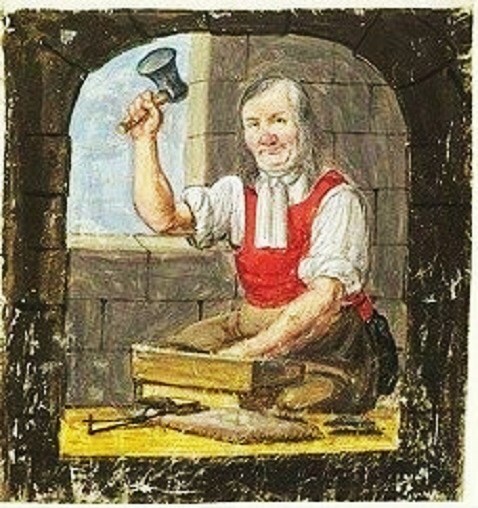 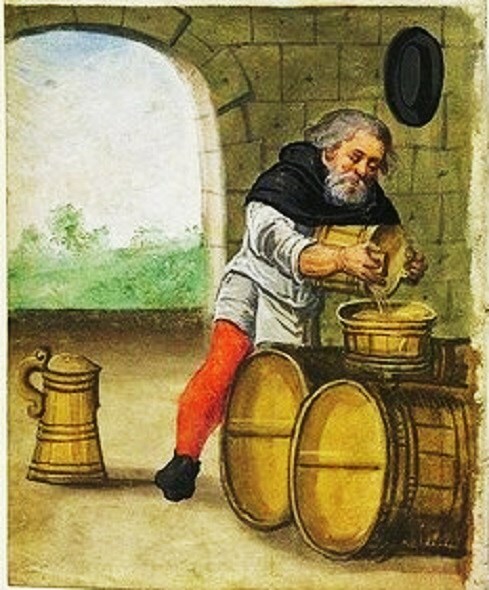 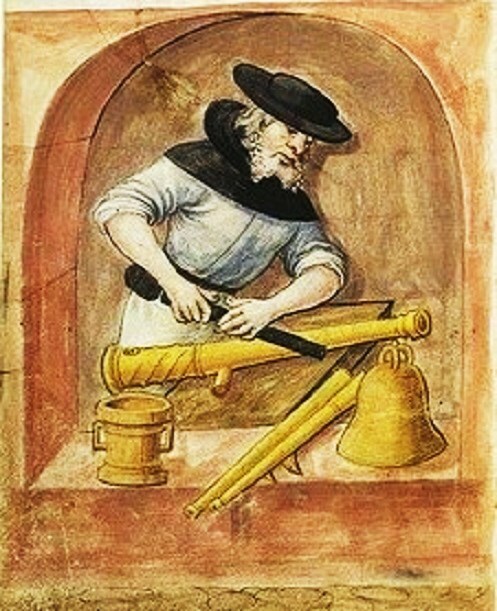 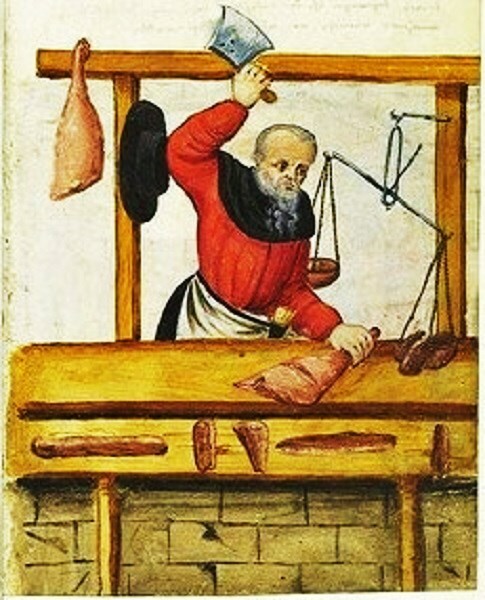 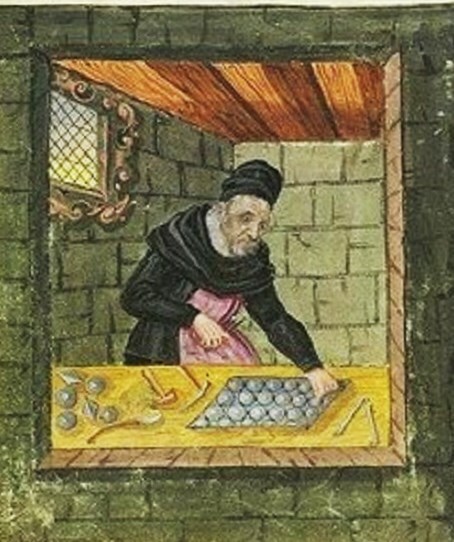 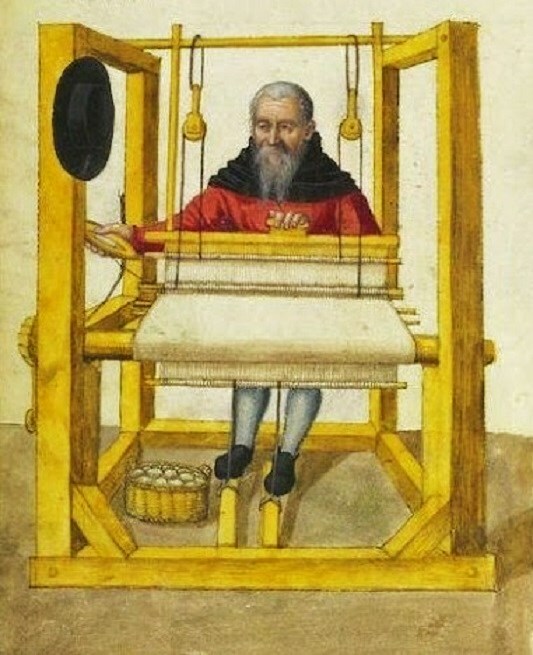 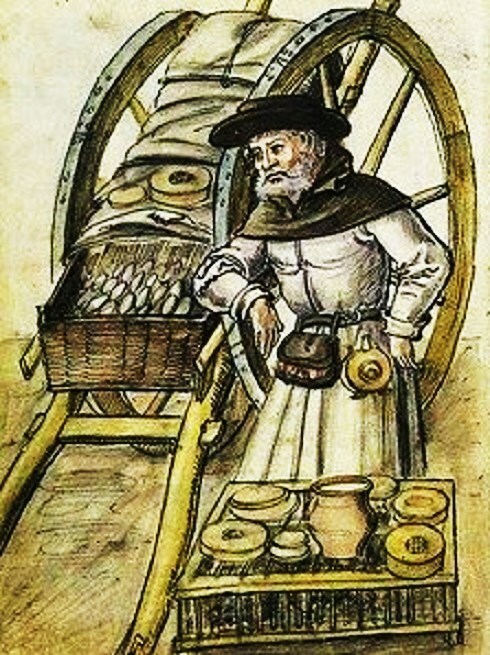 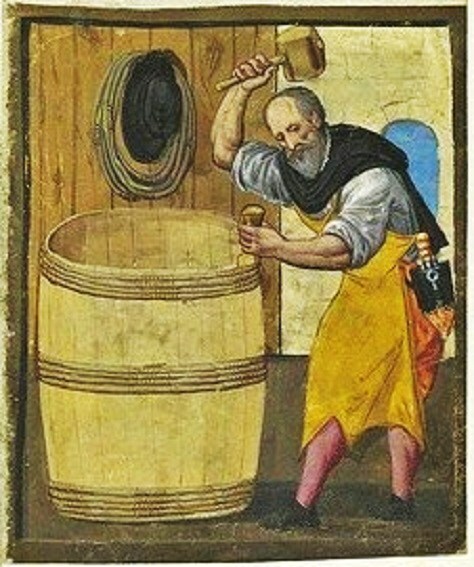 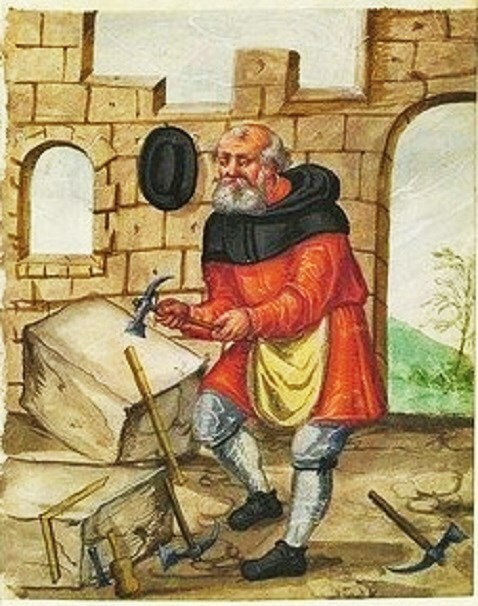 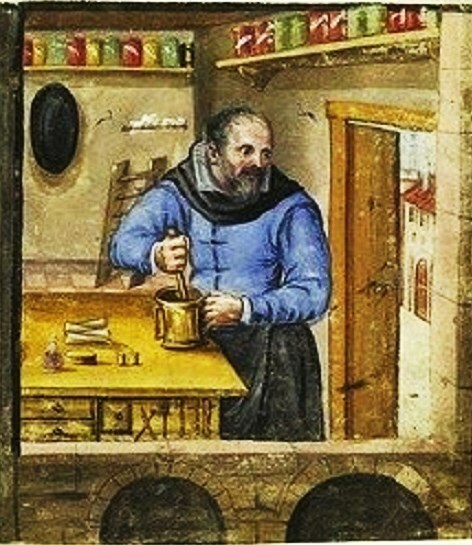 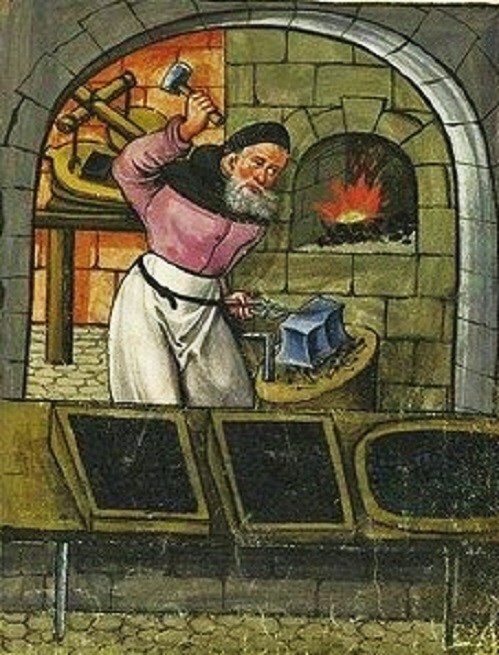 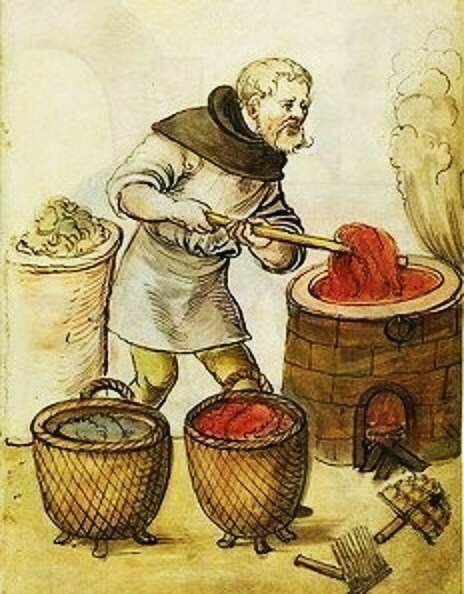 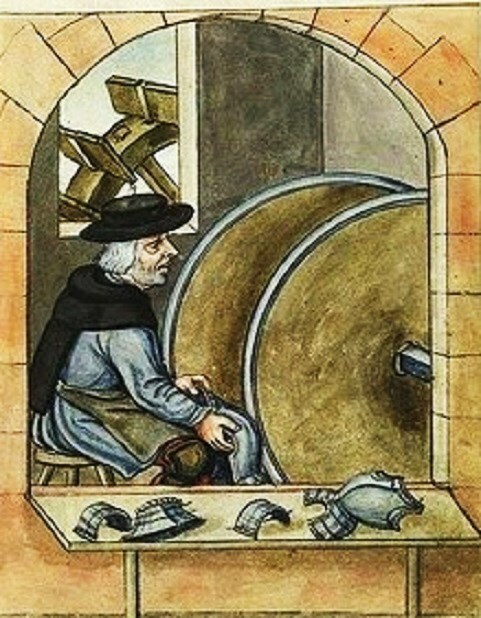 In 14C Germany, a wealthy trader by the name of Mendel established a charitable endowment in the city of Nuremberg, called Twelve Brothers House Foundation (Zwölfbrüderhausstiftungen). 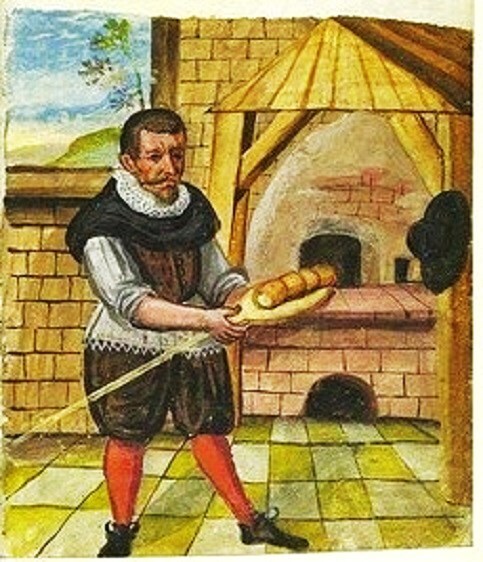 A dozen older citizens were given a place to live in exchange for their performing work duties. 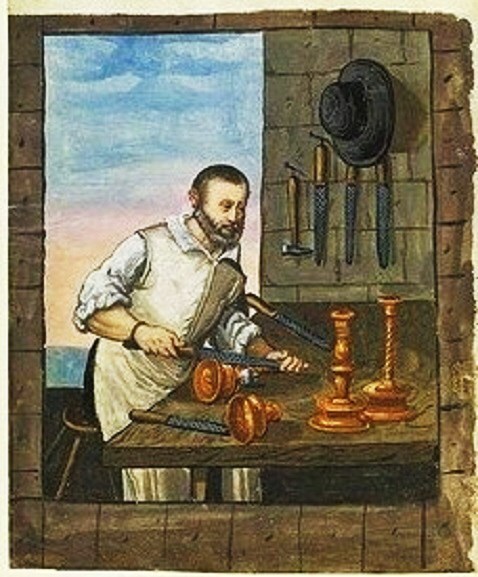 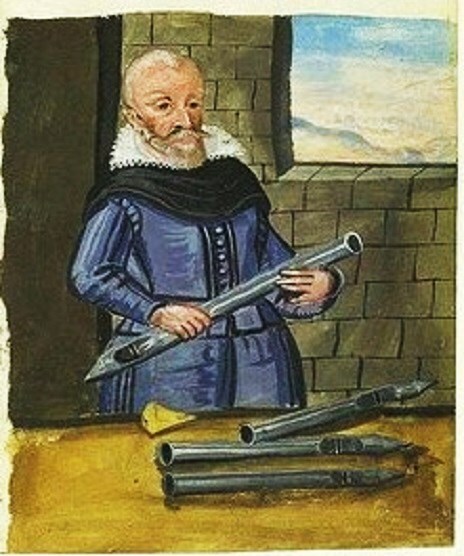 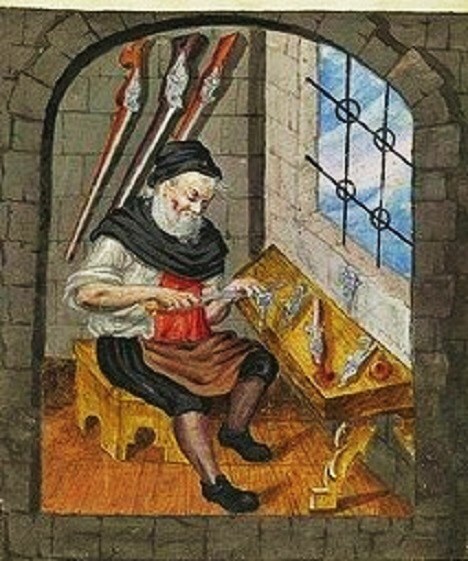 In the 15C, Mendel's grandson began having sketches made of each of the brothers engaged in their chosen craft together with detailed notes about the tools & practices relating to their work. 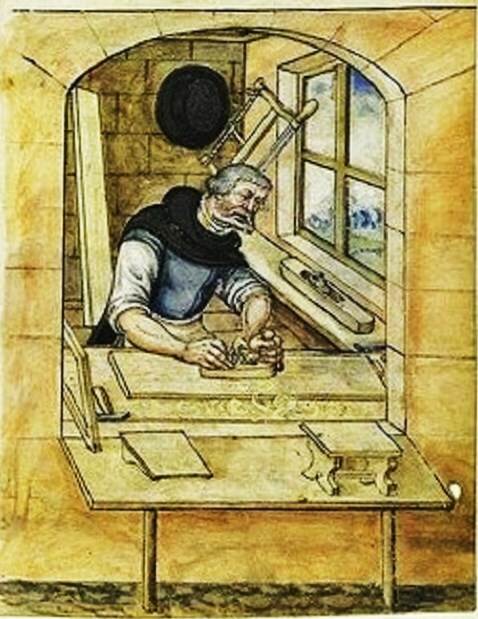 In the most strict definition of the term, an illuminated manuscript only refers to manuscripts decorated with gold or silver, but in both common usage and modern scholarship, the term is now used to refer to any decorated or illustrated manuscript from the Western traditions.